I am very happy that there are people like the Chinese artist/activist Ai Weiwei (for more information, you might visit his profile on artsy.net). 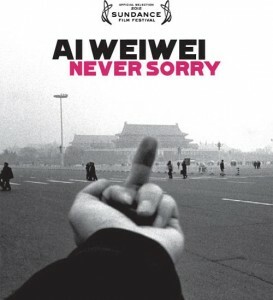 The second film I watched at the 2012 Movies that Matter Festival, Alison Klayman‘s Ai Weiwei: Never Sorry (2011), follows his work. Ai Weiwei is a classical example of what the Greeks in ancient times referred to as a ‘parrhesiast’. This denotes a person who ‘courageously speaks the truth’. By most of his art, Ai Weiwei endangers his own life by calling our attention to all sorts of deplorable situations in China. He comes across as fearless, but admits being scared with many of his actions. For a long time, he managed to keep his balance on the ‘razor’s edge’. He seemed to get away with a good deal more than other Chinese dissidents. However, in early 2011, he was arrested for 81 days. Since then, many of his basic freedoms have been taken from him. In spite of this, his motto remains ‘never retreat, retweet’. If you and your browser read Chinese, you can follow him as @aiww on Twitter. A good deal of his work deals with ‘showing the unshown’. An impressive example is his work about the 2008 Sichuan earthquake, which killed around 90.000. This included thousands of children, to a great extent due to the poor construction of school buildings. One of Ai’s works consisted of creating a horrendously long list of all the children that died. It covered an entire wall of his office. On top of that, he invited families to send him voice recordings of the names of their children. For an exhibition at the Munch Haus der Kunst, he covered an enormous wall with 7.000 schoolbags. The image read: ‘she lived happily for seven years in this world’. One commentator in the film says that he is doing the work that government should have done. His contribution is not appreciated. At some point, policemen break into a hotel room in which he is staying. He receives a serious blow to the head, for which he is eventually operated. Fortunately, he managed to take a picture of the event, just before being hit. He uploads it to Twitter, where is goes viral. His own case becomes a central node in portraying the misconduct of government and police. The pictures of his face after operation, and the occasional middle finger, are symbolic for the suffering many others. The term ‘making things public’ is often used as a colloquial description of publicising, of showing the unshown. The French philosopher Bruno Latour (1947-) has given a twist to this term. He first started this in his introduction to the catalogue of the 2005 exhibition Making Things Public. Atmospheres of Democracy at ZKM in Karlsruhe. First of all, he focuses on the ‘thing’ that is made public. Often we are hardly aware of the role of material objects in creating public awareness, popular debate and democratic processes. Particularly in the case of art this is a major flaw. The long list of names, the voice recordings, the school bags, the images of his assault, all play a role in a much broader process. The second element of Latour’s ‘twist’ is what it means to make something ‘public’. 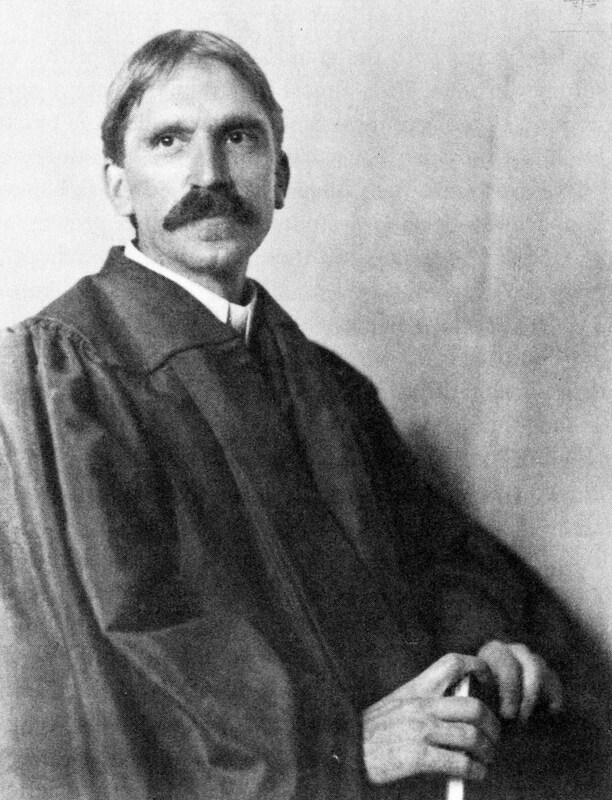 To make this clear, Latour refers to the notion of ‘the public’, which John Dewey (1859-1952) presented in his 1927 book The Public and Its Problems. A public is a group of people that is confronted with the negative consequences of something that is beyond their control. A public might organise actions to turn the situation for the better. Latour argues that such ‘publics’ often evolve around ‘things’ or ‘matter’. For example, a hazardous crossing in a domestic area can turn into a ‘matter of concern’, as Latour calls it. 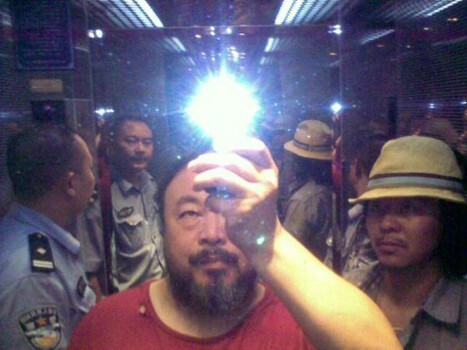 I would say that a lot of Ai Wei Wei’s work can be described as making ‘matters of concern’. Given the setting of the Movies that Matter Festival, perhaps it would be more appropriate to speak of ‘matters that matter’. An important idea in Latour’s philosophy, is that ‘things’ or ‘nonhumans’ should also be regarded actors. Normally, this privilege is reserved for people by modern philosophers. Latour shows that some ‘things’ are more influential than some people. He defines an actor as ‘that was was made to act by others’. To act is always a collective process. It takes more than just humans. The film shows clearly how the pieces of art that Ai Wei Wei creates can move people. They are actors that are ‘made to act’ by Ai, his workshop assistants, a bunch of tools, thousands of years of Chinese history and the billion of Chinese now living.Together, they turn ‘matters of concern’ into ‘matters that move’. A public of sunflower seeds? 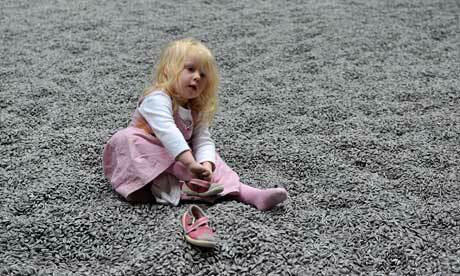 One of Ai’s most acclaimed works was his 2010 exhibition of a 100 million sunflower seeds at the Tate Modern in London. The sheer volume of seeds becomes even more impressive when you get to know that they are hand-painted pieces of porcelain. Sadly, the exhibition was changed when all the walking turned out to produce porcelain dusts that are harmful to people with asthma. It became a ‘matter of concern’, in its museum context. This piece of art created an unexpected public of its own. I went to see a smaller version of the exhibition in Museum de Pont in Tilburg, the Netherlands, a week ago. This ‘matter of concern’ has some very unfortunate side-effects. It looses all its playful seriousness. The seeds are ‘squared in’, and are constantly guarded. There is a one-meter-distance norm. Karl Marx is said to have asked: ‘How can you have a revolution if you can’t get people to walk on the grass’. This piece of art is made to be tread upon. What are we supposed to do when we are no allowed? I wish I had had the courage to defy the guards, take off my shoes, and run barefoot across the sunflower seeds. I think Ai Weiwei would have. Movies that Matter 2012 I – Bitter seeds, bitter questions? Yesterday was the first day of the annual Movies that Matter Festival in the Hague, the Netherlands. It was the beginning of a week-long programme of films and debates on human rights issues. I attended Micha Peled‘s new film Bitter Seeds. It is the third installation of his globalization trilogy, also featuring Store Wars: When Wal-Mart Comes to Town (2001) and China Blue (2005). The new film focuses on the suicide wave among Indian farmers. The challenge of keeping their families alive is immense. As a result of this, one farmer ends his life every 30 minutes. One while reading this blog, three while watching Bitter Seeds. As in his previous films, Peled succeeds in presenting a compelling, personal story. The film follows Manjusha, a college student, in her efforts of providing journalistic coverage of the circumstances of the villagers in her surroundings. Peled is there at every step of the way, following the entire process from planting cotton seeds to selling the produce on the local market. It feels as if you could smell the soil, and feel the softness of the cotton on your skin. The film unfolds the connection between the suicides and the introduction of genetically modified (GM) seeds, by the US-based corporation Monsanto. This story reminded me of the work of the German philosopher Peter Sloterdijk (1947-). The notion of immunity is important in his latest books, as I noted in earlier posts. Monsanto claims that its genetically modified seeds make cotton ‘immune’ for attacks by certain insects. This is achieved by modifying the seeds with the Bacillus thuringiensis (Bt) bacterium. 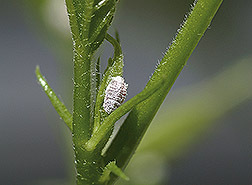 Nevertheless, such Bt cotton is not resistant against the mealybug. This requires additional treatment with chemical pesticides, which are typically applied without any safety precautions. The film shows how the spray is dripping down on the farmer’s bare feet. Despite all this hard labour, many crops get infected and fail to produce. The pesticide market in the Indian village is also dominated by Monsanto products, as the film shows. Before the invasion of Bt seeds, cow dung was used for pest control, a much cheaper and organic alternative. The problem is bigger than that, however. 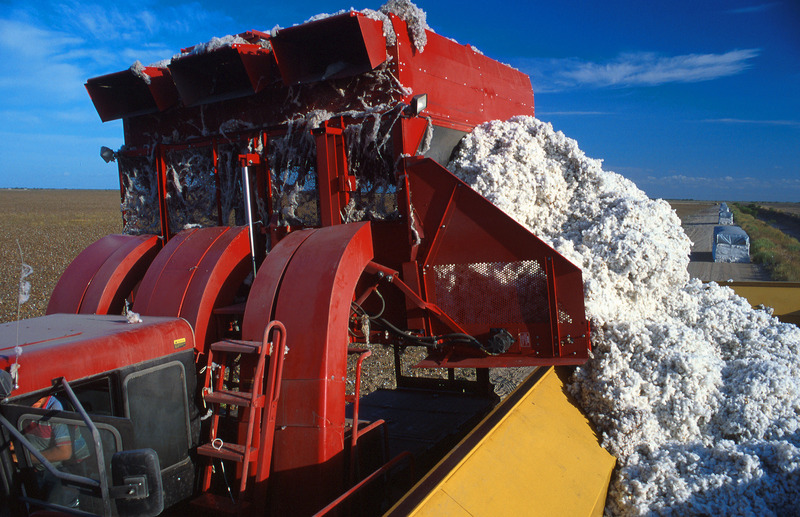 Cotton production as envisaged by corporations like Monsanto seems to be only viable in an industrialised setup. It would require much larger farms, mechanisation of work and crop rotation. This implies the complete modernisation, and effectively, the ‘creative destruction‘ of traditional cotton production as a way of life (for a similar example see my earlier post on the documentary Garbage Dreams). Whatever your opinion on such developments, it seems that such a choice should not be made by American corporations. The suicide wave is also related to India’s prevailing social system. The film focuses on one aspect: the dowry that is traditionally paid at weddings by the father of the bride. This system has existed for centuries. 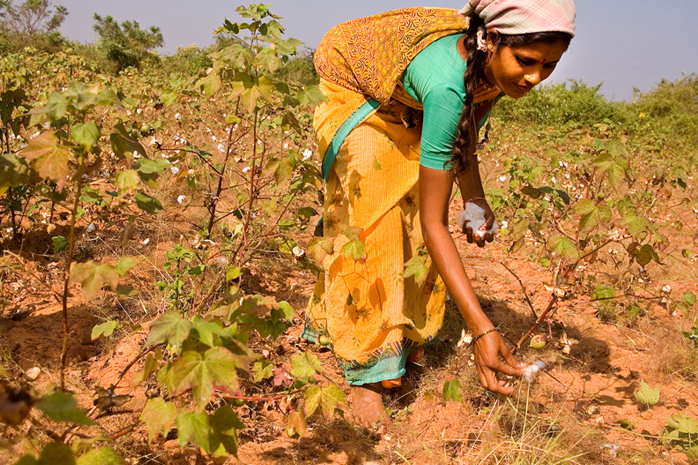 According to the film, it is no longer sustainable now that the costs of cotton production have increased with the introduction of genetically modified seeds. Fathers can no longer ‘afford’ to have daughters. Despair over outstanding debts is the main cause of suicide. It seems that the introduction of a seed that is not as ‘immune’ as it was supposed to be, is also messing with the ‘immunity’ of families and the social system as a whole. Due to the complete take-over of the cotton seed market by Monsanto, farmers can no longer protect themselves. Attempts to bring back the seeds that preceded genetic modification fail, as the film shows. There are small scale initiatives to introduce organic farming to a few Indian villages, however, by people like Vandana Shiva. This requires major subsidies, however, which are hard to find. So far, there is often no way out. After the film, I had a drink with mr. Peled and a manager of a company that focuses on organic fruits and vegetables. I asked a question, which seemed to be perceived as impertinent by the manager. I wonder if it was. I invite you to leave your thoughts below. Earlier, the issue had been raised that a film ought to be made that portrays ‘the consumer’. I would surely welcome such a film. Over the past weeks, I watched about 15 documentaries dealing with the ethics of trade. I was surprised to find that the position of the consumer received hardly any attention at all. I suggested that such a film, if it were made, ought to portray the challenges that consumers face. Increasingly, individuals are made responsible for the working conditions at the other end of the world. Many have suggested that fairtrade consumption is a ‘fix’ that stems from a neoliberal mindset, even though we tend to think of it as an alternative. In one of his lectures, the Slovenian philosopher Slavoj Žižek argues that fairtrade is an example of ‘cultural capitalism’: by consuming, you do good while sustaining the system of global capitalism. There is a short video of the lecture, with wonderful animations, which I would recommend to anyone. This was considered a ‘boring topic’ by the manager. I asked if they happened to have seen the documentary The Bitter Taste of Tea: A Journey Into the World of Fairtrade (Borgen & Heinemann, 2008). This controversial film suggests that working conditions on fairtrade tea plantations are often not much better than on non-certified plantations. Assuming this is true, what does this mean for consumers? Can we trust the certificates that are presented to us, or do we need to open every ‘black box‘ ourselves, to speak with the French philosopher Bruno Latour (1947-)? My comments seemed to offend the manager at our table. He replied, rightly I think, that improving working conditions needs to happen step by step. He suggested that we shouldn’t criticise those who try. Was he right? I partly agree. We cannot expect the world to change at once. However, I would argue we need to have fair but critical investigations of the attempts we make. This does not need to result in criticism, but in a discussion nonetheless. To what extent is certification possible as a guarantee, as the logo promises? Is it perhaps partly a utopia, given the current governance of global trade? What does it mean for me, as a consumer? Can I rely on the fairtrade logo, or do I need to do more? Cameras are important technologies when it comes to human suffering. They are used by violators, defenders and may also be the embodiment of human rights violations. How are cameras portrayed in human rights cinema? This edition focuses on surveillance cameras. Surveillance is generally perceived as an invasion of our private sphere. In a liberal mindset this equals an infringement of our human dignity. But is it that straightforward? The documentary The Devil Operation (Boyd, 2010) shows how every minute of the life of Father Marco, a Peruvian priest, is captured by cameras. He is involved in peaceful actions that demonstrate the abuse of the local population by international mining companies. After a while, he becomes aware that cameras are pointed at him, and that they are controlled by a private security firm, which is hired by the mining companies. Marco and the people surrounding him are pursued and threatened. He is code-named “the devil” in this surveillance operation. Can we say that his dignity is violated? If so, cameras are used as a mediator. In an interesting turn of the movie, Marco turns the surveillance around. Acquiring cameras himself, he decides to follow those who follow him. If, indeed, his dignity is violated, we might argue that he re-established it, vis-à-vis the interrogators, by his course of action. This would show dignity as a condition that is actively developed in a relation between different actors. Unlike in the previous film, the documentary You don’t like the truth. 4 days inside Guantánamo (Côté & Henríquez, 2010) allows us to look through the surveillance camera ourselves. The directors came across footage that captured a four-day interrogation of 16 year old Omar Khadr by the Canadian Security Intelligence Service (CSIS). Omar, a Canadian citizen, was taken to Afghanistan by his father after the war on terror had started. When he was fifteen years old, in 2002, he was captured by Americans after they attacked the house in which his father had left him. It was defended by Afghan fighters. He was found with two shot wounds in the chest. Omar was accused of killing an American soldier, for which he was interrogated and tortured by American officials. Afterwards, he was brought to Guantánamo bay. The low-quality footage of the surveillance camera shows how his Canadian interrogators try to blackmail and intimidate him. It is shocking to see such psychological abuse, particularly that it concerns a minor. The camera captures it all, also when the interrogators get angry with Omar for retracting his original confession, which he stated after torture. They claim that he is not speaking the truth now. His original story must have been correct. Sixteen year old Omar looks at them and says that he is telling them the truth now. They just don’t like the truth. Here we might recall the previous film, in which it seemed that dignity was dismantled and reassembled in the reversible interaction between the one that watches and the one that is watched. For the present film, it is not clear whether the boy feels that he re-captures a bit of the dignity that had been taken from him. In the end, he looks defeated. Unlike father Marco, he did not have the option of inverting a camera: the camera was already pointed at the interrogators as well. On the other hand, the camera did enable Omar’s dignity to be construed in the relation between himself and his international audience. By showing his interrogators’ dislike of the truth, we might say that he established himself as an incredibly dignified teenager. Moreover, this might apply to the Canadian parliament as well, for which the film was screened. Again, we are faced with a relational, technology-mediated conception of dignity; but, one that works somewhat differently than in the previous film. A last case, in which surveillance cameras take on an entirely different role again, is shown in one of my favourite shorts: A boy, a wall and a donkey (Abu-Assad, 2008). The film is only just over 4 minutes, so you may want to watch it (below), before reading on. We are presented with three Palestinian boys, who are desperately trying to shoot a movie. They have a crime story, they have guns, but they lack a camera. First, they squat the doormat of a sizable villa, using the camera of the intercom to record their masterpiece. We, as spectators, have the privilege of seeing the uncut “footage” it produces. During the first scene, a lady opens the door and throws a bucket of water on them. Soaking wet, the bravest boy demands the tape. To his great surprise he is explained that this camera doesn’t film anything, but just shows who is outside. Nevertheless, we, as spectators, do get to see what it “records”. Perhaps, a bit of their dignity as promising film makers is lost in this communication. This doesn’t stop them from mounting their donkey – three boys on one donkey (an unintentional pun on the symbol of the knights Templar?) – to march to the Israel-Palestine wall, where an actual surveillance camera is installed. Rather than showing what is “outside”, this camera seems to show what is “inside”. The same scene is re-enacted. This time, however, the boys need to act while shuffling sideways, according to what the ever-rotating camera points at. All of this to the background of the imposing concrete wall. Before reaching the end of the scene, a violent siren interrupts them. As a border patrol car speeds in their directions, one of the boys contemplates to his peers that it may be bringing their tape. Their dignity seems to be unaffected. This probably does not apply to other Palestinians when they approach the wall. On the basis of these cases, it seems clear that we cannot derive a general understanding of human dignity by examine a number of cases. Nevertheless, it seems promising to adopt a constructivist perspective on human dignity, as long as we take into consideration that it is constituted in relations that are likely to be mediated by technology. In last week’s blog, I made a case for applying Peter Sloterdijk’s ideas on immune systems to the aftermath of hurricane Katrina, which hit the American gulf coast in 2005. 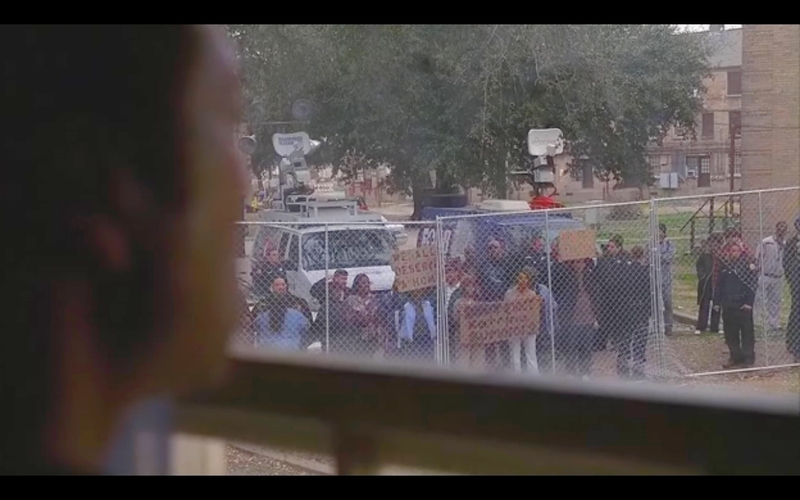 In this week’s blog, I draw on examples from the fictional HBO TV-series Treme (Simon & Overmyer, 2010-11), a documentary of two prankster activists The Yes Men Fix the World (Bichlbaum, Bonanno and Engfehr, 2009) and Spike Lee’s second Katrina documentary If God is Willing and da Creek Don’t Rise (Lee, 2010) to show how this could be a way of examining practical politics. The immune system of the city as a whole is targeted by a character of the first season of the popular HBO TV-series Treme: Creighton Bernette (John Goodman). Bernette is a writer with writer’s block, and a professor of literature at a local university. Befitting his societal status, his wooden house with a gig antic porch was built on higher grounds and was left untouched. His notion of space is the entire city, and its protection again future storms. He spends most of his non-writing time giving furious interviews to different kinds of journalists. Most of them concern the US Army Corps of Engineers, which were, and are responsible for the levees that need to be higher to maintain the city’s immune system. He only finds the proper medium to suit his voice when discovering YouTube. In one of his videos, he rants that ‘a bunch of idiot planners are busy running around putting green dots on maps deciding which neighbourhoods they think should return to cypress swampland’ (see last week’s blog for en explanation of the green dots). Bernette tries to accommodate to the space of the new city, taking part in mardi gras and community life, but cannot cope. His own living space is increasingly small: he withdraws to a dark room in the garden house and ends up sleeping on the porch. At the end of season one, he commits suicide, in the wide open of the Mississippi river, jumping off the ferry. Another character, “big chief” Albert Lambreaux (Clarke Peters), also “acts on” the green dots, but in an entirely different manner. He is not concerned wit h maps or the internet, but with the fenced off housing projects that he sees close to his own house, which was ruined in the storm. His politics concerns the issue of people not being able to come home. Unlike Bernette’s city-focus, he is concerned with the immune system of the space that used to house communities that are now dispersed across the land. With the aid of friends, he cuts through a fence and squats one of the sealed off houses. By breaking the “isolation” of the fence, he changes the ontological status of the housing project. In a single unitary space within a fence, he unveils the lot of micro-spaces that used to be people’s homes. By occupying such a house, he transforms it into a living space. His example is followed by others. Before long, the police remove him with disproportional force, in front of a large public of bystanders and TV cameras. The two activists that call themselves the Yes Men perform a similar disclosure of green-dotted neighbourhoods. With one of them pretending to be a representative of the US Department of Housing and Urban Development (HUD), they stage a hoax at a prestigious conference. Speaking after then-mayor Nagin, he announces that HUD is aware of its mistakes, and that he is proud to present that all the fenced-off housing projects will be ceremonially opened that afternoon. On top of that, Shell and Exxon will fund the renewal of the wetlands. The hoax is discovered, but not before they manage to hold a ribbon-cutting ceremony at one of the projects. Media try to make them look bad by arguing that they played a cruel joke on all the people who were “not allowed to come home”. Interestingly, by such statements, media actually take over the activists’ slogans. Interviews with attending citizens, however, show the opposite. The Yes Men’s hoaxes usually meet wide support of the disadvantaged. Rebuilding an immune system, in this case, required creating the hope of a community. A small public was formed by “two guys in cheap suits”, as they describe themselves, but it will take more to “fix the world”. The documentary was a worldwide success. When neighbourhoods are rebuilt, it is often through the introduction of “mixed housing”. This pushes up rents to such levels that the original inhabitants can no longer afford to live there. In this respect, the action of Brad Pitt’s Make it Right project, as described in Spike Lee’s documentary, is highly interesting. Even though it targets green dotted neighbourhoods, the focus is on the immune systems of family houses. In sharp contrast with government- or market-driven building projects, the project constructs affordable, environmentally sustainable and storm-resistant houses. This extends beyond building houses on poles, capturing a holistic immune system’s view. Features included: green roofs, rainwater harvesting, pervious concrete, raingardens, tree-planting & protection (for water absorption) and porous streetscape. They are not over-isolated: all of them have escape hatches to the roof. From the point of view of micro-space immune systems, it is interesting that the project is criticised for being no more than ‘a few individual houses in a sea of empty lots, there are no sidewalks, schools or shops’. We are back to Sloterdijk’s islands. Perhaps they lack co-isolation. For the individual level, we leave the green dots and return to the Yes Men. They crash another conference, this time dedicated to technologies for flood-victims. To their surprise, the tools offered would be more suitable for surviving heavy warfare than a storm. This brings them to stage their own (fake) technology, the SurvivaBall. The concept seems to draw on Sloterdijk’s work almost literally. The title of their presentation is “What Noah knew”, explaining that by creating the space of the ark, Noah effectively became ruler of all animals. The ball represents a one-man ark. Sloterdijk uses arks as an example of completely isolated islands. On top of that, the Yes Men show in their presentation that the balls can even connect to form a larger, co-isolated, foam-like organism that can float across a sea, like an actual island. To their surprise, their presentation is received with great approval by the audience. Last year, Amnesty International presented its report – entitel Un-natural disaster. 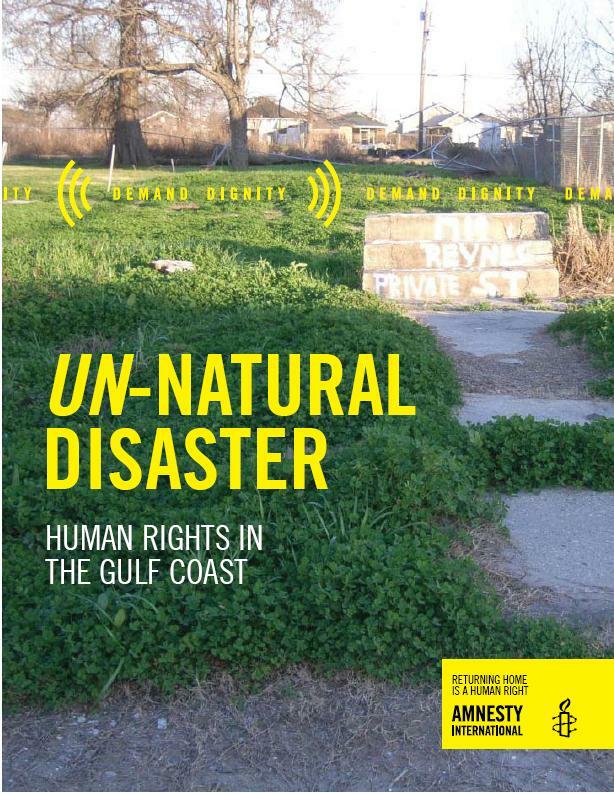 Human rights in the gulf coast – on the aftermath of the 2005 hurricane Katrina. Amnesty argues that ‘returning home is a human right’. Many former residents are still dispersed over a range of different states. The trauma that the storm caused to the United States is reflected in the number of films that cover it. In next week’s blog, I draw on the fictional HBO TV-series Treme (Simon & Overmyer, 2010-11), a documentary of two prankster activists The Yes Men Fix the World (Bichlbaum, Bonanno and Engfehr, 2009) and Spike Lee’s second Katrina documentary If God is Willing and da Creek Don’t Rise (Lee, 2010). Before that, a short tale of how to understand green dots and other spaces. ‘co-isolated islands, interconnected to a network, which briefly or chronically ought to form medium or large structures with neighbouring islands – a national assembly, a club, a freemasons’ lodge, a gathering of co-workers, a shareholders meeting, an audience in a concert hall, a suburban neighbourhood, an accumulation of motorists in a traffic jam, a congress of tax payers’ (Spheres III). Co-isolation is the idea that neighbouring bubbles in the foam share a “wall”: the indoor wall of my private space might be the outdoor wall of yours. The next point that Sloterdijk makes is that all these different bubbles, globes and spaces have their own immune systems. Partly, this is to be understood metaphorically. For instance, how do we protect the invasion of our private space from intruders? At the same time, it is translated to concrete material manifestations of architecture and urban planning. Pointing at technological advances such as climate control and air conditioning, he shows how modern houses have their distinct immune systems to make the space inhabitable. We could regard politics in post-Katrina New Orleans as a debate about spaces and their immune systems. The system was tested by the storm, and failed. 53 levees that were to keep the water out collapsed, many long before the fury of the storm was at its peak. It was the water that destroyed the city, rather than the wind. Roughly 80% of the city was under water, sometimes up to 20 feet. Close to 2000 people died. Tragically, this was also due to “over-isolation”: many people were trapped in their attics, dying of heat and lack of water. It was also the immune system of particular neighbourhoods that did not hold up, or even that of individual houses that had not been elevated properly. Some areas on higher grounds –built before 1900 – were safe. All these spaces are interconnected. Houses, some even sharing walls, are connected to particular neighbourhoods, all of which constitute the foam of the city, which was seriously shaken up by the storm. These spaces provide us with a more systematic approach to our search of publics and their problems. The term “green dot” is notorious for New Orleanians by now. Planners look for ways to improve the sustainability of the urban environment. Billy Fields shows that one of the tools that is popular in green urbanism is the notion of “greenways”: open spaces that function as a ‘buffer between ‘nature’ and urban areas’ . In Sloterdijk’s terms, such an “artificial” green zone can be regarded as an example of strengthening the co-isolation of nature and human space. In principle, it seems reasonable to argue for such an approach in New Orleans: a major reason for the severity of the damage was that the wetlands that had traditionally functioned as a buffer had slowly but surely been urbanised and economised during the 20th century. Fields speak of ‘the “conquest of wetlands within the city limits”’. Also the doings of major oil companies like Shell and Exxon contributed to destroying wetlands, as John Manard Jr. and others add. The expanded island was not protected well.As Fields shows, the idea of greenways was finally accepted in New Orleans. The idea that preceded it was less successful, however. 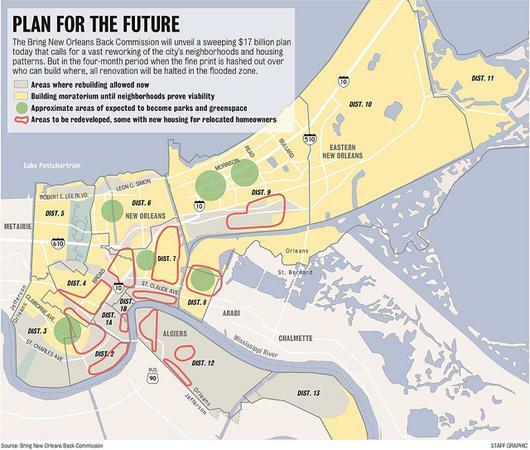 The Bring New Orleans Back (BNOB) plan was presented to the public early 2006. A local newspaper ran an article in which the initial proposals for creating green spaces were represented as green dots on a map. These spaces did not relate to buffers between nature and urban areas, but to the more general notion of green spaces in a city. The map led to instant fury, considering that the green dots covered whole neighbourhoods. Maria Nelson and others argue that ‘[m]any residents understood that all green areas were slated for green space, and the green dot became a threat to neighborhood residents’. What is more, the dots generally covered low-income, black neighbourhoods. Planners stressed that no form of discrimination was intended. Nevertheless, they add that ‘“recommendations to reduce flood risk equal ‘ethnic cleansing’”. Intentional or not, the dots became political actors. Next week’s blog will continue the discussion of immune systems in the aftermath of Katrina, showing examples in documentaries and TV-shows. The 23rd edition of the International Documentary Film Festival Amsterdam (IDFA) is just over. In this special, I look back at some of the human rights films in which technology played a special role. The Most Dangerous Man in America (Judith Ehrlich, Rick Goldsmith, 2009) won the Special Jury Prize at IDFA 2009 and was screened again this year. The film shows how Daniel Ellsberg leaked the 7000-page Pentagon Papers to the press in 1971. These papers contained a study by the department of defense, which documented how the public and congress had been lied to about U.S. involvement in the Vietnam war. By now, it is almost a cliché to compare these events to the recent circus around WikiLeaks, especially from the point of view of technology. It is a case in point to show how technological progress has changed the work of whistleblowers and of activists in general. ‘I’m glad to see that new technology being exploited here. I couldn’t have released on this scale 40 years ago. In fact, I couldn’t have done what I did do without Xerox at that time. Ten years earlier I couldn’t have put out the Pentagon Papers’. We still tend to look at technology as a meteorite that simply enters our atmosphere at a certain point. We split history in the “time before impact”, and the “time after”. The line that divides Ellsberg and Assange is the transition from the Industrial Age into the Information Age. What if we don’t look at technology from outer space, however, but from where they are, right on our desks, or kitchen counters? First, let’s look at this issue a bit closer from the point of view of the people involved. Ellsberg is typically presented as Assange’s historical predecessor. How correct is this observation though? Assange does not leak information. He is publisher and editor-in-chief of information that others leak to him, as he keeps on repeating. Bradley Manning, an ‘unparalleled hero’ to Assange, was working in Iraq as an intelligence analyst for the U.S Army. He was arrested in May 2010, and hasn’t been released since. Then, it makes sense to establish a historical connection between Ellsberg and Manning. Who was Assange’s 1971 counterpart? Neil Sheehan, perhaps? The journalist of the New York Times who received Ellsberg’s copies? Or Arthur Ochs Sulzberger, the Times’ publisher at the time? Let’s focus on Ellsberg and Manning for now, and try to feel what must have gone through them while they had their hands on their technology. ‘Having decided not only to photocopy, but to leak the papers, Ellsberg enlisted the aid of Anthony Russo, a former Rand associate. Russo had a friend with a Xerox machine in a Los Angeles office. Mid- photocopying, the men heard a knock at the door: it was the Los Angeles Police Department. Assuming the worst—that the government had already tracked them down—Russo thought to himself, “God, those guys are good.” In reality, the coconspirators had accidentally tripped the building’s burglar alarm, and the police ofﬁcer departed after an explanation from the ofﬁce owner, who was on-site to assist Russo and Ellsberg’ (Trzop, 2007, p. 18). The film on Ellsberg does a good job in using animation for this scene. We see the policy officers peaking in through the blinds, expecting Ellsberg to be caught red-handed. Particularly the image of his 11-year old daughter Mary sticks in your mind. I imagine how the beam of the officer’s torch would catch the large and shiny pair of scissors in her hand, with which she was just about to cut off the words “top secret” from another page. There were over 7000 of these pages. It took them months to do it. How different this was for Bradley Manning. Let’s see how he supposedly described the scene in a chat on May 22 with former hacker Adrian Lamo, who reported him to the U.S. Army. This is what the Guardian reported on December 1, 210. Just a note: different versions of these logs circulate. This comparison is interesting from the point of view of what is called “clicktivism”, or “slacktivism”. Many fear the decay of “courageous” forms of activism, due to internet-based causes that can be supported by “one click of the button”. Critics argue that if you sign petitions, wear ribbons, or join a Facebook group, it rather serves your personal sense of self-respect than that it serves the actual cause. Clicktivism is said to replace activism. No one would claim that what Bradley Manning did was not courageous. He is certainly no clicktvist. Still, he noted himself how easy it was to do what he did. This is particularly apparent in comparison with Ellsberg’s case. Recently, concrete technologies are said to stimulate ethical reflection. 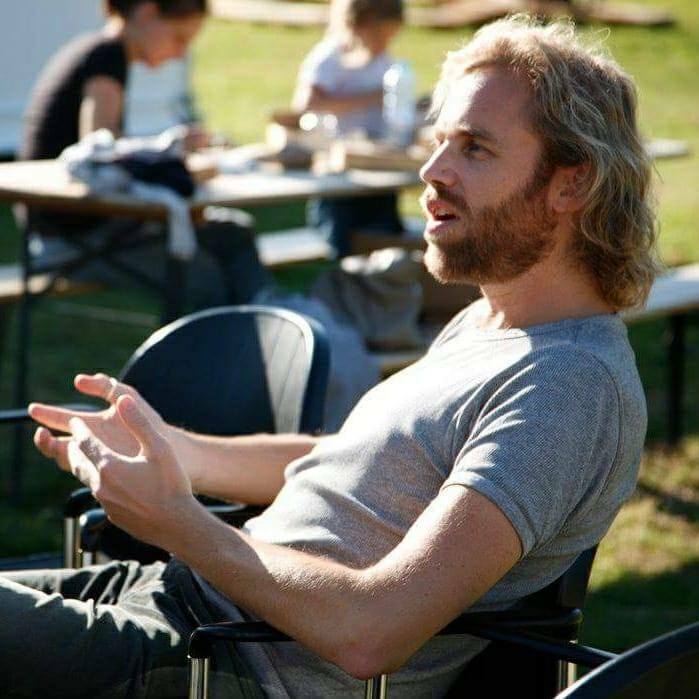 Dutch philosopher Peter-Paul Verbeek shows how ultrasound images during pregnancy “make” the foetus a person. This creates a new relation between the unborn child and the future parents. On the one hand, any serious disease that is detected on an ultrasound might probe parents to consider abortion. On the other hand, the newly established relation may also be a factor against abortion. Technologies can make us think. Something similar happens here, but in an entirely different way. As the comparison of the Ellsberg/Manning cases shows, the concrete technologies with which they interacted changed the “time of activism”. The Xerox machine did not allow Ellsberg to cover more than a certain number of pages per night. Manning’s clicks to copy and paste allowed him to store thousands of documents in the time-frame of a Lady Gaga song. Ethical reflection takes time. I am curious to know what went around in the minds of these men. Certainly, Ellsberg had more time to think things over. More time to establish for himself that he would risk imprisonment for what he did. Can we say that time was on Ellsberg’s side? Or was it on Manning’s? Would Manning have gone through with his leaks if it had taken him months? Would he have considered the consequences of his deeds differently? Once again, he is no less courageous or heroic this way. It’s just that time does funny things. Unfortunately, he has his time to think, in prison. Thinking about clicktivism this way, the time spent does become a crucial factor. Probably even more so than the question of being courageous. In line with the view of technology as something that stands on your kitchen table, rather than as some meteorite from outer space, let’s end with a remark by Daniel Ellsberg. When questioned whether he envied the technological advantages of preset-day whistle blowing, he answered: ‘Actually, I’m envious of the new Xerox machines. They collate, and they staple. They do everything for you. I could have saved a lot of time’. After the attention that blood diamonds received, we turn our attention to a less sparkly, but equally bloody mineral: coltan. Patrick Forestier already introduced the topic in his documentary Blood Coltan (2007). The cell phones that we carry in our pockets contain this material. Whether it is “bloody” or not, we don’t know. 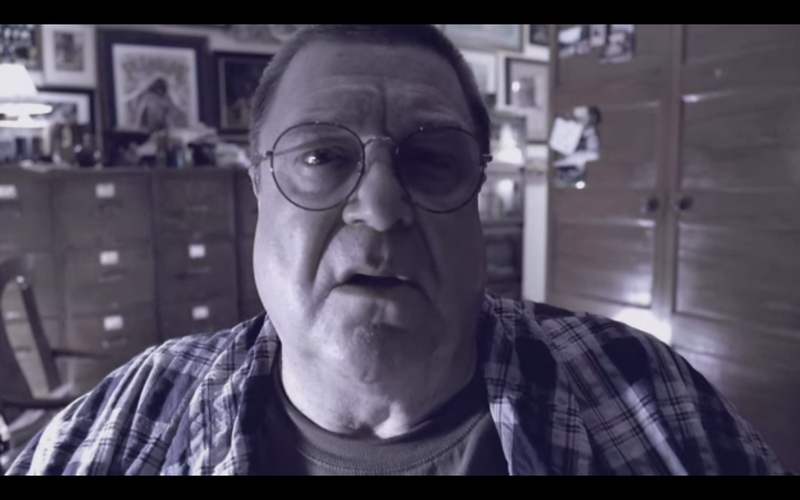 Director Frank Piasecki Poulsen wanted to figure this out about his own Nokia. He made Blood in the Mobile (2010), which was shown at this year’s IDFA. What makes coltan bloody? Part of it is extracted in conditions of slavery in the mines of the Decmocratic Republic of the Congo. Passing through shady supply chains, warlords manage to bring their produce to our markets. The revenue is used to fund the civil war, which is estimated to have killed around 7 million Congolese since the late 1990s. Technologies have politics, in many different ways. Langdon Winner famously uncovered the racism of New York bridges in his 1980 article Do Artifacts have Politics? They were made so low that buses wouldn’t fit underneath. As a result of this, poor black families were kept away from Jones beach, a white middle-class resort. In similar vein, Bruno Latour showed that some door closers can discriminate against ‘very old and very small persons’ (see his article Where are the Missing Masses?). They are too heavy for them to open. Morality is fundamentally embedded in such technologies, but in a particular way. In a sense, they select their users. Cell phones may also be “charged” with blood, but in a different way than the examples before. They don’t stop any user from calling. They don’t discriminate on the basis of race, age or bodily functions, at least not in the way that bridges or door closers do. In fact, one of the problems is that we can’t even know if there is blood in our mobile our not. What these technologies do, however, is to ruin the lives of miners and others in the Congo. Mobile phones don’t discriminate against users, but against producers. It is hard to understand this problem, partly because the relation between one miner and my cell phone is less direct than the relation between a bridge and a black driver, or a door closer and an old lady. The coltan had to pass through a whole supply chain to go from a 15 year old miner’s hand into my pocket. Many of the technologies we use are black-boxes. We don’t actually know how they work, or how they are made. Typically, we only figure this out when they break, and we have to re-assemble them. Talking about a simple case like an overhead project, Bruno Latour makes us understand that such an artefact is in fact the end station of a whole network of relations that had to come together for us to use it. If we want to trace this network to its roots, we have to reverse the process of black-boxing it, as Latour calls it. The same applies to a phone. In an impressive effort, Poulsen, the director of the film, tries to trace the steps that were taken to produce his Nokia. Exposed to severe dangers, he actually gets to the source, the oppressive dark of the mines in the Congo. What he doesn’t know, however, is if this is where the coltan for his phone came from. There are also mines in Australia for instance. The steps that lead up to the (online) shop window are unknown. In vain, he besieges Nokia’s headquarters with his camera, trying to get them to disclose their supply chain on their website. You can read what they are currently doing in this area, but read it with a dose of skepticism. It’s incredible to realise to what an extent violations of human rights can be hard-coded into a piece of electronic equipment. Human rights are materialised this way. Cell phones are not the only example. Think of the jeans that are produced by child labour, for instance. Also the pocket that holds my phone might be compromised. This was shown very well in the documentary China Blue (Micha Peled, 2005). An underage Chinese girl slips a note into the pocket of one the pants she makes, for some Western customer to find it there. Kind of like a message in a bottle. Normally, there is no way to “transcend” the supply chain like that. If we want to stop these kinds of abuse, the relations need to be traced, the nodes of the network. Or, if one cell phone producer decided to put a bloodless phone in the market, others might follow. After all, we can also buy slave-free chocolate in Holland nowadays.